When I moved into my new place the other day the first thing I did was not get cable. I'm tired of spending a fortune to have 600 channels of nothing to watch. 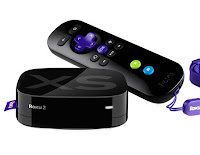 I prefer to spend a flat $40 for the same luxury with this Roku Streaming Media Player . Today only it's half off, and you don't even have to pay for shipping! Instantly stream over 100,000 movies and TV shows from Netflix, Amazon Instant Video, Hulu Plus and more. Listen to music on Pandora, or listen to your own iTunes playlists. Watch major sports, news, or original Internet programming. It's also about the size of a hockey puck. Click here to view the deal at 1Sale.com.